There are 46 games in the Skybet Championship and that gives strikers ample opportunity to rack up 20+ goals over the course of the season. At the time of writing 21 games have been played, so we’re almost at the halfway point and the goal-scoring charts are starting to take shape. This is a good point to look at the market for a bit of value now that the main contenders have been established. It’s no surprise that the front men scoring the goals are from the teams troubling the top of the table, and it makes sense to look for a player with a team who can go the distance. Derby’s Chris Martin heads the market and is available at the best price with Bet Victor. His team have been up and around the top of the table all season, and in Steve McClaren they have an experienced manager. They suffered the heartache of play-off defeat at Wembley to QPR last season and will be pushing for automatic promotion this year to avoid the same result. They tend to score freely, particularly at home, and Martin will get plenty of chances to add to his tally so far. He’s grabbed 12 goal in 21 appearances this season, and is currently 2nd in the scoring charts to Ipswich striker Daryl Murphy. Ipswich are 4th in the league and are having their best season for a number of years under manager Mick McCarthy. They’re only a point off the top and Murphy has helped himself to 13 league goals in 20 games so far. They definitely look like contenders for the play-offs at least, but there has to be a question of whether they have a big enough squad to maintain a title challenge. If the Tractor Boys suffer a poor run of form later in the season the chances could dry up for Murphy, and he looks a short enough price for this market, even though he’s top right now. Gestede has fired in 12 goals in 19 games this season as Blackburn have climbed the Championship table, and he’s a surprise contender with Jordan Rhodes the man expected to do the business for Rovers this year. They’ve dropped to 8th in the table recently with two straight defeats, and with just four wins in their last ten they look to be experiencing a patchy run of form. There have to be questions again over whether they have the squad to keep supplying Gestede with the chances, and he could be in a bit of a false position in this market. Assombalonga has netted 12 times in 20 games for Stuart Pearce’s Nottingham Forest side, and they are still within touching distance of the play-offs after a dismal run which has seen them drop away from the top of the table. They’ve only won twice in ten but Assombalonga keeps on scoring the goals, and if they can turn their form around there could be even more opportunities for him. Forest can be expected to be competing for promotion for the rest of the season, and should be worthy of a play-off place come May 2015. Assambalonga should get the chances, it’s a question of whether he can maintain his personal form for the whole campaign. 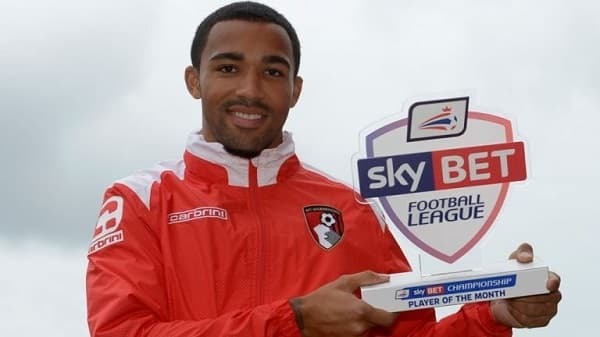 The striker that stands out at the prices is Bournemouth’s England under-21 forward, Callum Wilson. The young front man has scored 10 goals in 20 games for Bournemouth this year, and that has coincided with the South Coast club’s rise to the top of the Championship table. There’s been a lot of investment in the team over the last few years, and that’s starting to pay dividends on the pitch this season. The Cherries have lost just once in fifteen matches, and could be on their way to automatic promotion. There’s often one team in the Championship that start to dominate and pull away from the chasing pack at this stage, and Derby, Middlesborough and Bournemouth look the best placed teams to do so. If Wilson continues to score at a rate of 1 in 2 he’ll be there or thereabouts by the end of the season. Norwich striker Cameron Jerome has found the net 9 times in 17 games so far this season, and is a big price to work his way up the goal-scoring charts. He’s had experience at a higher level in the Premier League, and his class at this level has already shown this year. Norwich are in and out of form, but they have won their last two games including a 5-0 thumping of Huddersfield, and things could be on the up. They have an abundance of striking talent at Carrow Road however, with the likes of Hooper and Lafferty in the squad, and it’s not certain that Jerome will start every match as the season progresses. Another lively outsider who is a class act at this level is Fulham’s Hugo Rodallega. He’s already bagged 9 goals in 16 appearances, and the Cottagers will need his goals if they’re going to make a late charge for the play-offs. They’re in 14th place, a huge 10 points off the play-offs, but can take heart as there’s usually one side who come with a late run for the top six. Rodallega scored the only goal in the weekend win at Leeds, and the club are in the position where their need for points dictates an attacking approach to games. That could suit the Fulham striker, and if manager Kit Symons can get them playing the sort of football that they were playing in the Premier League he should get plenty of opportunities. Two players can be backed in this market, with most bookies offering 1/4 the odds for a top four finish each-way.